In 1873, during construction of a reservoir at Humbledon Hill near Sunderland, a prehistoric barrow was found. In this barrow were three Food Vessel urns. Each urn contained a cremation; two urns had been inverted over the cremation, the third urn was badly crushed and it was difficult to tell its original orientation. Only two of these urns survive. Food Vessel urns are much bigger than standard Food Vessels – the two examples from Humbledon Hill are 350 and 370mm high. 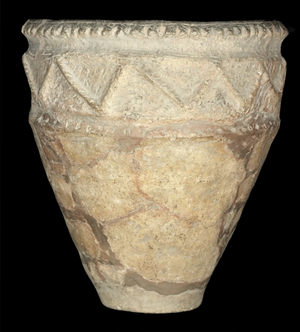 The larger of the two vessels is decorated with incised decoration, a characteristic common with early vessels such as Beakers. However, the other vessel, which is shown here, shows the new decorative technique that developed during the Bronze Age, whereby decoration was applied to the pot, as well as incised decoration. This pot was decorated with horse shoe shaped impressions on the bevel and twisted cord on the moulding. Clay pellets were applied to the rim along with whipped cord maggots in the cavetto. Chevrons are applied to the shoulder groove, with a horseshoe pattern applied to these chevrons. These vessels show how pottery technology was beginning to change during the Bronze Age. Potters were now able to make bigger pots than ever before, and they had more techniques available to them to decorate them This period marks a high point in prehistoric pottery in north east England, building on techniques developed during the earlier Neolithic. In north east England the standard of pottery declines during the Iron Age, when the highly decorated forms are abandoned in favour of simpler, undecorated forms. Miket, R. 1984. “The Prehistory of Tyne and Wear” Northumberland Archaeological Group. The pots are currently on display in Sunderland Museum and Winter Gardens.